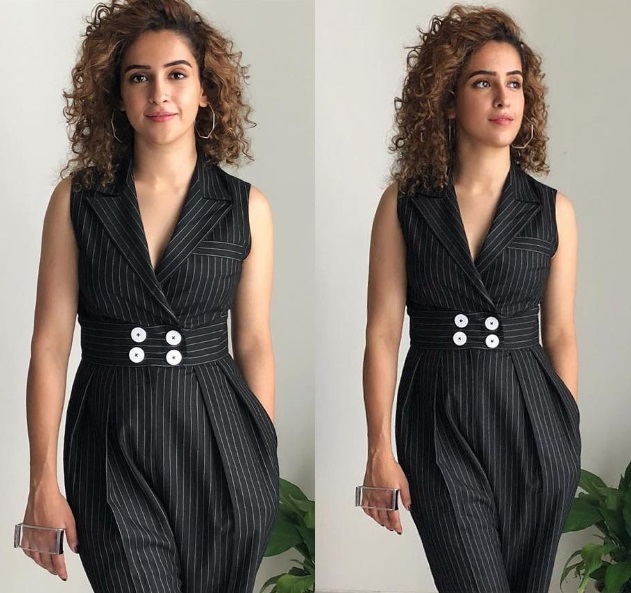 Promotions for her movie Pataakha saw Sanya in a striped jumpsuit by Notebook paired with white sneakers. While she started her day wearing an interesting rectangle palm cuff from Valliyan, looks like she took it off later. With or without it, she still looked good. Agree? While at an event promoting her upcoming movie, Chitrangda was photographed in an Astha Narang suit. Wearing her hair down, she rounded out the look with earrings from Valliyan, a cocktail ring and pair of black peep-toe pumps. Not the biggest fan of those sheer, embellished sleeves. Wish Ms. Singh would give minimalist Indian-wear a try! At the HT Most Stylish Awards, Kriti was a picture of sunshine in her fringe Deme gown that was paired with hoops and stacked bracelets from Valliyan. I especially loved the turquoise nail paint. Having said that though, just when I was about to give the label credit for something nice, turns out, the gown itself seemed to be very inspired by the winner of Project RunwaySean Kelly‘s design which was worn by Heidi back in 2014. Le sigh. While filming on the sets of her television show, Shilpa was photographed in a Neetu Rohra jumpsuit. Vintage brooches from Viange, a Flowerchild cuff, H&M rings and pair of Louboutin pumps rounded out her look.